Marie-Véronique started studying music at the age of 4. First on violin, then on piano, she discovered the flute at the age of 8. At the age of 11, Marie-Véronique auditioned and was accepted at the Quebec Conservatory of Music where she studied with Barbara Todd-Simard and later on with Jean MORIN. She was awarded First Prize in both, Flute and Chamber Music, from this institution. As an active musician in Quebec City, Marie-Véronique performed as a soloist with different orchestras. 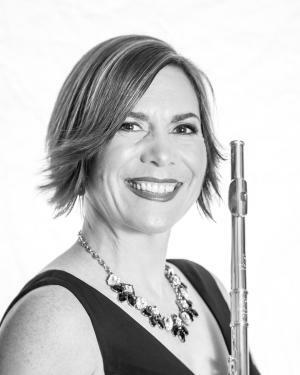 She was a member of the Gilles Auger Chamber Orchestra and previously was part of the Quebec Youth Orchestra in residence at the Orford Centre of the Arts and the Orchestre des Conservatoires which toured the Province of Quebec. Marie-Véronique also had numerous flute students throughout the years in private and group settings, teaching in different schools in Quebec City.Marie-Véronique was awarded the Musician's Prize following the Orchestre Symphonique de Quebec's Competition. She was one of the laureates of the CITF-FM radio station music competition and was National finalist from the Concours de musique du Canada. After winning her first professional audition, Marie-Véronique joined the Royal Canadian Mounted Police (RCMP) Band stationed in Ottawa, Ontario, in 1992. After the disbanding of the band in 1993, Marie-Véronique decided to follow her musical career while becoming a full time RCMP officer. She worked in detachment, in the Custom & Excise Section, as a Media spokesperson, as a member of the Drug Awareness Service and on the Clandestine Laboratory Investigative Team (Drug Section). During the same years, Marie-Véronique became known for her unique interpretation of our National Anthem on piccolo which she performed in Canada and Europe for different venues and ceremonies. 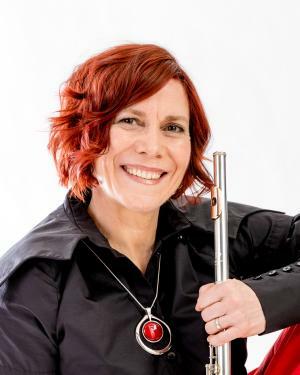 In 2006, she was selected to become an instructor at the RCMP Academy and accepted a transfer to Regina, Saskatchewan.In 2007, Marie-Véronique auditioned for the Regina Symphony Orchestra and won a position as flute utility. At the same time she joined the Quarter Tones Flute Ensemble formed of Tara Semple, Linda Lucyk and David Popoff. 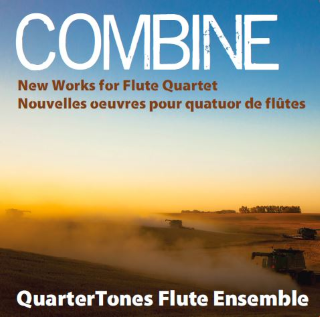 Together they commissioned various works from Canadian Composers and were invited to perform during the Break Out West in Calgary in 2012. They were also invited for a residency at the Banff Center of the Arts and launched their first album COMBINE in June 2015. In 2014, Marie-Véronique also joined the Per Sonatori Baroque Ensemble based in Regina.Marie-Véronique is a versatile musician who can adapt to different cultural styles. For the past several years, she has been an active musician within the Fransaskoise Community. She also performed and recorded with the Free Range group specialized in World Music on different types of flutes.During the 2012 Mosaic Festival in Regina, Marie-Véronique was invited by a well known Saskatchewan jazz pianist, Maurice Drouin, to join him on stage. With him, Marie-Véronique learned some of the Cabaret repertoire and jazz standards. She was also strongly encouraged to continue developing her natural ability in jazz. 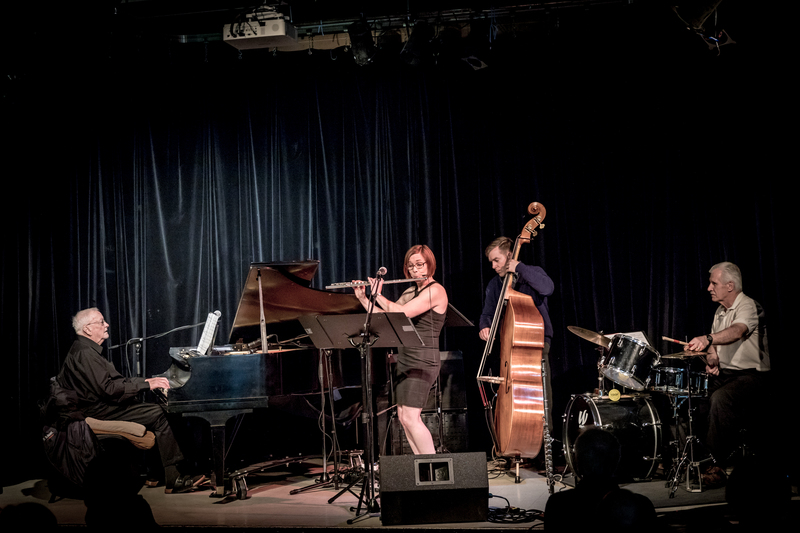 Marie-Véronique followed Maurice's advice and was awarded a bursary to attend the Carleton University Jazz Camp in 2014, where she had the opportunity to study with Dave Young, Elise Letourneau and other great jazz musicians. In 2015, Marie-Véronique joined the jazz group The Project. 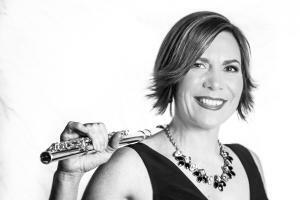 The following spring, she founded her own group, MV & Co, which allows her to feature some great French Jazz repertoire and play with the best musicians in local jazz venues and during the Regina Jazz Festival. During the summer 2016, Marie-Véronique continued her Professional Development in France by attending the Dordogne International Jazz Summer School and taking part in jam sessions in the best jazz venues of Paris. 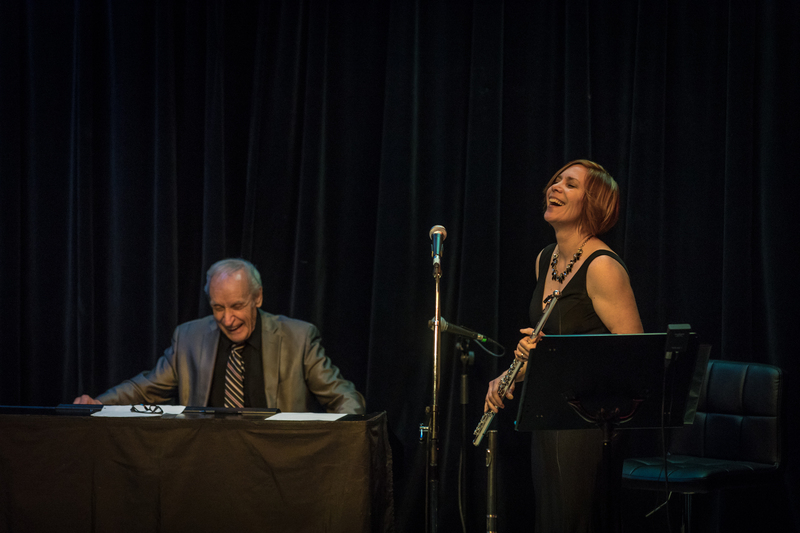 In October, she performed as a member of the Caligari Orchestra in a live performance of The Cabinet of Dr. Caligari, presented for the first time with the music of composer Jason Cullimore at the Conexus Arts Centre, Regina. 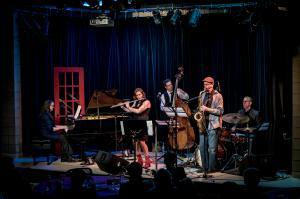 In December, she was featured in a live concert presented by the Regina Jazz Society. 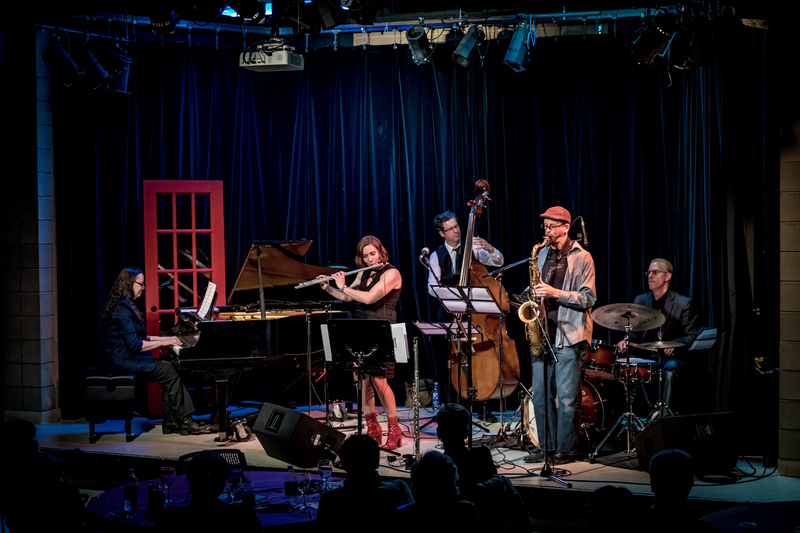 In February 2017, Marie-Véronique completed her first tour in Quebec where she performed in Montreal and Quebec City.In August of the same year, she attended the Ambrose University Jazz camp. 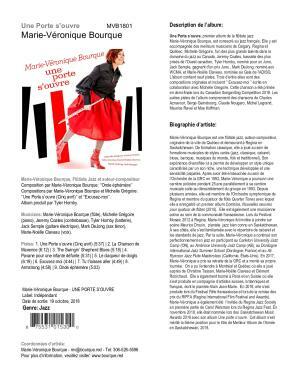 Last October, she toured Switzerland and Paris where she performed both Jazz and Chanson française. 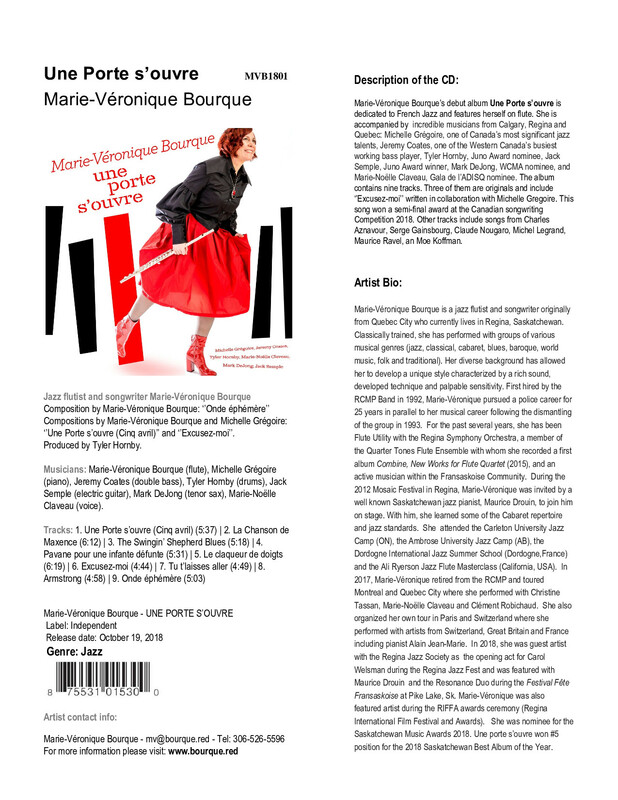 In January 2018, Marie-Véronique recorded her first jazz album which includes some originals. 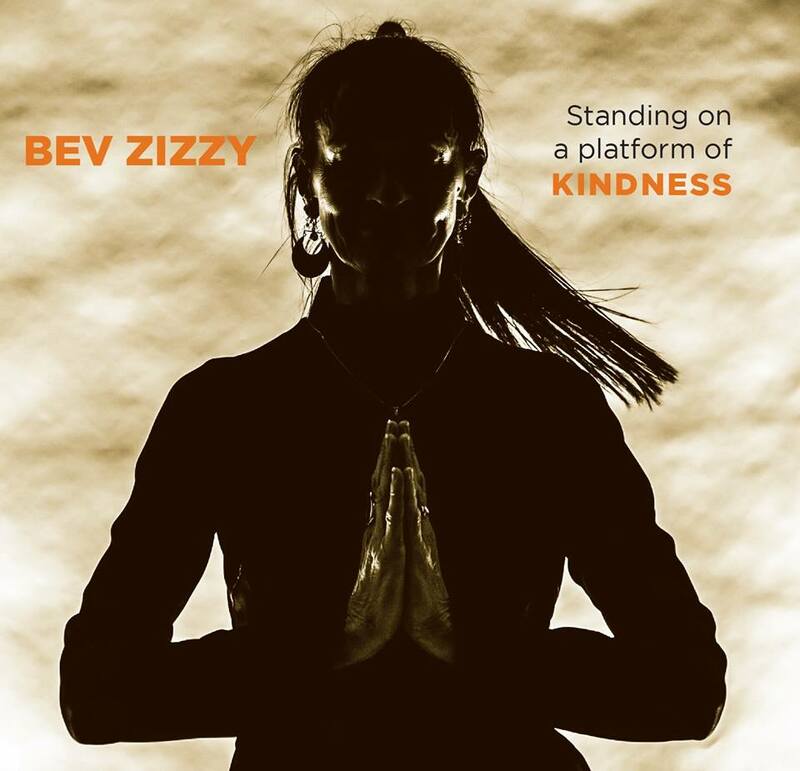 One of them ''Excusez-moi'' was selected in semi-finals at the Canadian Songwriting Competition 2018. 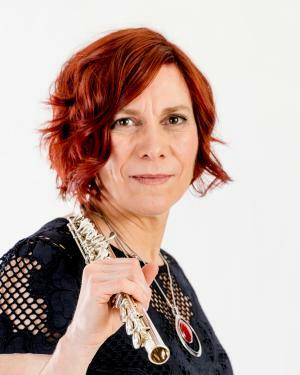 Marie-Véronique also performed at the Ali Ryerson Jazz Flute Masterclass (California, USA). 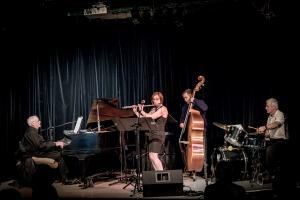 She was guest artist with the Regina Jazz Society as the opening act for Carol Welsman during the Regina Jazz Fest and was featured with Maurice Drouin and the Resonance Duo during the Festival Fête Fransaskoise at Pike Lake, Sk. In August, 2018, Marie-Véronique was featured artist during the RIFFA awards ceremony (Regina International Film Festival and Awards). En novembre 2018, elle était nommée lors des Saskatchewan Music Awards 2018 avec son album Une porte s'ouvre, lancé le mois précédent. Cet album s'est mérité la 5ième position pour le titre de Meilleur Album de l'Année en Saskatchewan, 2018. Une Porte s'ouvre a fait le palmarès radio à 17 reprises dont 2 palmarès jazz nationaux sur !Earshot. En janvier 2019, Marie-Véronique a présenté son nouvel album à Montréal et Québec avant de s'envoler pour Brighton,UK où elle était invitée à participer à Pro7ect19 (retraite pour auteurs-compositeurs et producteurs). For as long as I can remember, I have been surrounded by classical music. I studied violin and piano prior to falling in love with the flute. I always wanted to perform in a professional orchestra and decided early to start gaining auditioning experience in order to reach my goal. I won my first audition with the RCMP band, and took the challenge. I was first introduced to the art of improvisation with this group. When the band was dismantled a few months later, I decided to stay with the organization as a police officer while pursuing my musical career as a freelancer. Through the years, I have always kept the door open to new musical experiences which would help me grow as a musician and as an artist and allow me to follow my passion. 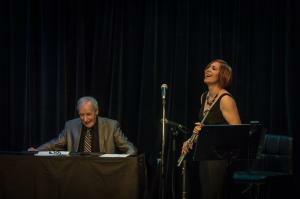 I performed with classical, baroque, folk, world music, traditional french, cabaret, blues and jazz groups. I discovered jazz as a performer few years ago and fell in love with this musical style. 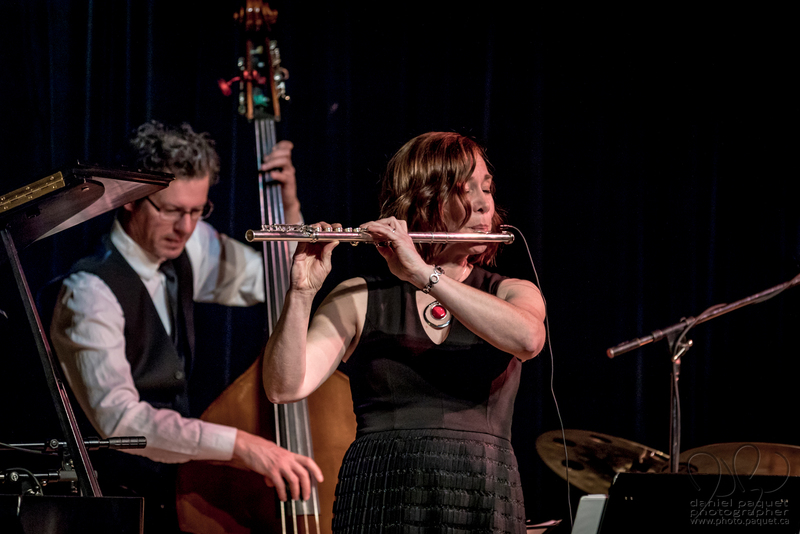 Jazz allows me to express myself with more freedom while reinforcing my identity as a French Canadian flutist through the French jazz repertoire I perform. 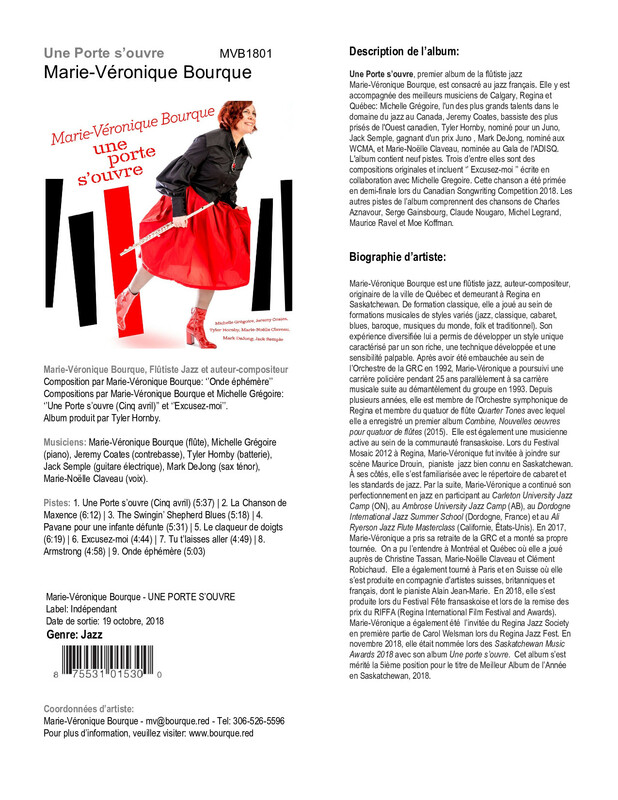 I am very proud of my first jazz album ‘'Une porte s'ouvre'' released on October 19, 2018. I invite you to keep your door open to the music and let it touch your soul!